Seminary - Esoteric Saints: Jacques de Molay, Simon Magus, Apollonius Tyanaeus, Hypatia, Bernard of Clairveaux, etc. 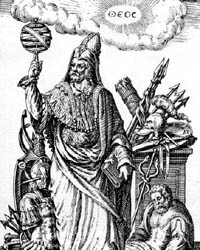 Esoteric Saints: Jacques de Molay, Simon Magus, Apollonius Tyanaeus, Hypatia, Bernard of Clairveaux, etc. London Times OnLine but here is the text. Another document is found after being ‘lost’ for almost 700 years. Vatican documents have ‘come to light’ showing that the wholesale massacre of the Knights Templar for alleged ‘heresy, idolatry and sexual perversion’, took place even though Pope Clement V had exonerated them in a secret trial. Was this to shift the blame from the Vatican to the court of Phillip IV of France ? ‘The relevation will put pressure on the present Pope, who has asked the Muslim world for forgiveness for the Crusades, to apologise for the persecution of one of the main Crusading Orders as well. The Templars, whose legendary power and wealth still exerts a fascination, were disbanded by Pope Clement V at the Council of Vienne in France in 1312. L’Avvenire, the Catholic daily, said that the record of the Pope’s investigation was thought to have been lost when Napoleon looted the Vatican during his invasion of Italy in the 18th century, and that its rediscovery was an exceptional event. The Templar Grand Master, Jacques de Molay, was burnt at the stake on the orders of Phillip IV of France, who coveted the Templar order’s land and treasure and began a campaign of dawn arrests and torture in 1307. At least 2,000 Knights were killed in an attempt to obliterate the order altogether. To this end he failed, as the Knights treasure and their large fleet that lay in the harbour, disappeared before the arrests commenced. ‘The concensus among historians was that Clement V, who was himself French and former Archbishop of Bordeaux, had been pliant and weak, and had colluded in Phillip IV’s scheme to wipe out the Templars and seize their fortune. But documents found in the Vatican archives, including a long-lost parchment, proved that the Pope had in fact maneouvred ‘with skill and determination’ to ensure that his own emissaries questioned de Molay and other leading Templars in the dungeons of Chinon castle in the Loire in 1308, in what amounted to a papal trial. Signor Frale, who is writing a book based on the Chinon parchment, says that the result was the complete exoneration of the Knights. A Gnostic mage with a large following including many of the disciples of John the Baptist. Blavatsky wrote of Simon Magus describing his abilities and stating that he lived in the 2nd Century AD rather than the time of Yeshua, and was so famous that the Romans erected a statue of him. 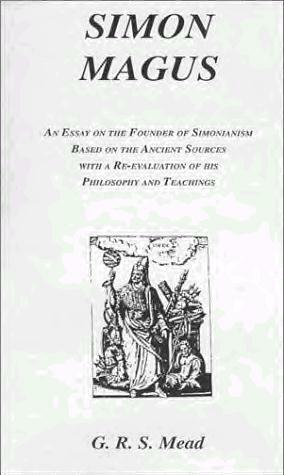 Simon Magus was another prominent miracle-worker of the second century, and no one denied his power. Even Christians were forced to admit that he performed miracles. Allusion is made to him in the Acts of the Apostles, viii: 9-10. His fame was world-wide, his followers in every nation, and in Rome a statue was erected in his honor. He had frequent contests with Peter, what we in this day would call miracle-matches in order to determine which had the greater power. It is stated in ‘The Acts of Peter and Paul’ that Simon made a brazen serpent to move, stone statues to laugh, and himself to rise in the air; to which is added: ‘as a set-off to this, Peter healed the sick by a word, caused the blind to see, &c.’ Simon, being brought before Nero, changed his form: suddenly he became a child, then an old man; at other times a young man. ‘And Nero, beholding this, supposed him to be the Son of God.’ “In ‘Recognitions,’ a Petrine work of the early ages, an account is given of a public discussion between Peter and Simon Magus. Many of the Baptist’s disciples joined Yeshua’s school, but many more stayed with Simon Magus as their leader because Yeshua couldn’t take them all. There is no evidence that Yeshua and Simon ever “fought” over students, and they were probably friends. Simon was later accused of sorcery and heresy by the Church and some rather fantastic tales were made up about him. He is mentioned in Acts Chapter 8. Supposedly he was baptized and even traveled with Philip for a time. The practice of Simony was named after him because he supposedly asked to “buy” the magical tricks of the Apostle Peter and John. One account of the time, however, says it was Paul who tried to buy these “powers” from Yeshua’s direct disciples, not Simon. When the Paulists later reconciled with the rest of the early Christians—when indeed, Paulanity became the central teaching of christianity—Simon Magus’ name was inserted in the story in place of Paul’s. This makes sense because Simon would not have asked for another baptism by one of Yeshua’s disciples when he himself had already been baptized by none other than John the Baptist. Paul never met Yeshua and had to overcome his bad name as a killer of christians and somehow bring legitimacy to the form of christianity he was espousing (inventing?). Paul wanted to be called an Apostle, but the word was reserved for only those who had studied under Yeshua, or at least met him in person. One wonders if the story of his “meeting” Yeshua on the road to Damascus was made up by him to satisfy this requirement. At any rate, many of the early christians sure thought Paul was a fraud, they were called anti-Paulists, and it was a long time before they were wiped out and the church had to find a fall guy for the story in Acts. Simon Magus ticked off certain church “fathers” because his Simonianism was big competition for their new version of christianity, a patriarchal state run church. The Roman’s had loved Simon, even erected a statue of him, but the church “fathers” (more like hijackers) hated anything gnostic and wanted to label anything that was not their idea as heresy. So Simon got a bad name and new stories were made up about him such as he fell to his death during a flying bout during a battle of the sorcerers between St. Peter and Simon. To this day fundamentalist christians call Simon the “perfect example of a Satanic believer.” Poor Simon got seriously bad press, but it was all after his death, so hopefully he didn’t mind. It is unclear how he died and there are even theories that two or three Simon Maguses existed, thus the stories of him living in 200 AD as well as at the time of the Apostles. Also called Apollonius of Tyana or simply Apollon. This pagan philosopher who lived at the same time as Yeshua, was of noble blood. He studied under a Pythagorean philosopher in Tarsus, oddly enough the birthplace of Paul – though the two are like night and day. Sickened by materialism and pleasure-seeking of his society, he became a cave-dwelling hermit for awhile. Then he went on to a mission of learning, healing, and teaching throughout the world – in Asia Minor, Assyria, Babylonia, Greece, Italy, Spain, Egypt, and India. He had Jain (then called “Gymnosophists”) and possibly Buddhist influences, and was later initiated into the Eleusinian Mysteries. After his death, legends of his miracle-working, prophesying, and charismatic spiritual teachings were recorded. His detailed life story, including some uncanny similarities to Yeshua’s life, was compiled by Flavius Philostratus (lived 170 to 250 AD) at the command of Emperor Severus. “The wonderful things done by Apollonius, thought to be miraculous, the source and producing cause of which Modern Spiritualism clearly reveals, were extensively believed in, in the second century, and hundreds of years subsequent; and by Christians as well as others. Murdered for her brains and beauty. Certain christian monks felt threatened by her and what she represented–the pagan wisdom of the ages as housed in the Library of Alexandria. She was head of the Platonic Academy in Alexandria. March 10 is her feast day in Greece. 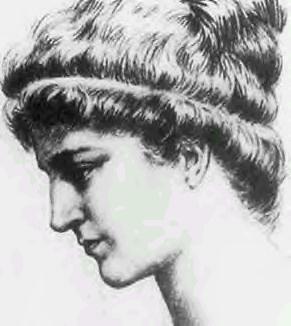 Enjoy Wikipedia’s bunch of Hypatia images, info and links. Hypatia’s prominence was accentuated by the fact that she was both female and pagan in an increasingly Christian environment. Shortly before her death, Cyril was made the Christian bishop of Alexandria, and a conflict arose between Cyril and the prefect Orestes. Orestes was disliked by some Christians and was a friend of Hypatia, and rumors started that Hypatia was to blame for the conflict. In the spring of 415 C.E., the situation reached a tragic conclusion when a band of Christian monks seized Hypatia on the street, beat her, then burned her remains. Bernard of Clairveaux was born in 1090 in Fontaines, France, near Dijon. While still young, he was sent to school at Chatillon-sur-Seine, where he developed a taste for literature and poetry, and a devotion for Mary the Blessed Mother. In 1113, he and about 30 of his closest buddies and relatives entered the Cistercian Abbey at Citeaux (currently under the leadership of St. Stephen). Three years later they were sent out to found their own daughter house, in a valley which Bernard named Clairveaux, which in tern spawned several daughter houses within a few years. 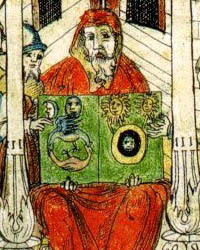 In 1120, he wrote his first works, ” De Gradibus Superbiae et Humilitatis” and “De Laudibus Mariae”. align=”Left”> However, among Esoteric Christians, Bernard is best known for his work at the Council of Troyes (1128), wherein Bernard proved to be a major supporter of the Knights Templars, for whom he gave an altered version of the Cistercian rule and presented them with the red cross on white which became their hallmark. Bernard then went on to publicly praise the order in “De Laudibus Novae Militiae”. 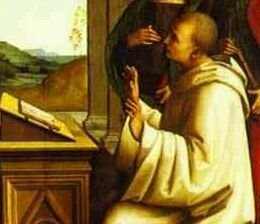 Bernard grew to become the one of the most powerful men in Christendom, even seen as more powerful than the Popes he served, as he was seen to have put the Popes on the Throne of Peter himself. However, throughout his career, he never lost his initial devotion to the Blessed Mother, and his theological works never lost their shimmer. Esoteric Christians may be interested by his sermons on the Song of Songs, and his On Loving God.